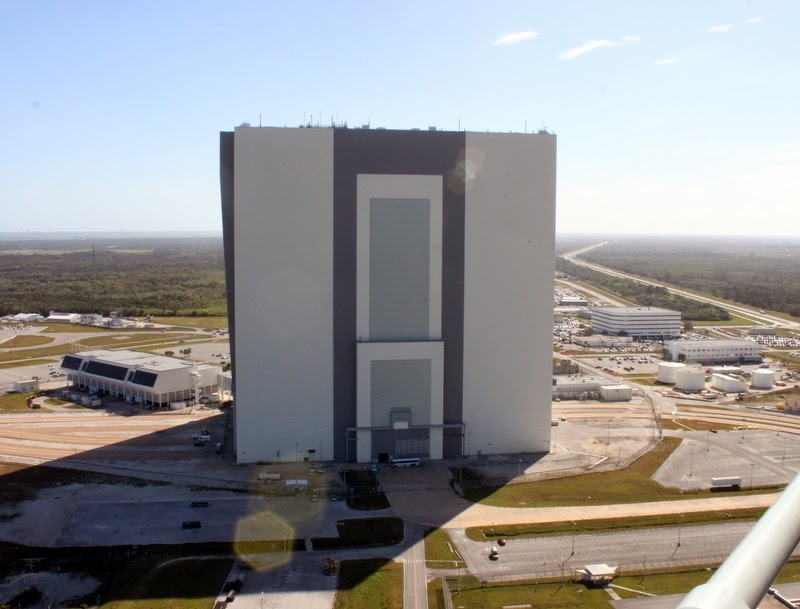 The Vehicle Assembly Building (VAB) is a magnificent thing. You cannot grasp the size of this structure unless you view it up close and personal. Look closely at the photo above, there is a regular size tour bus parked in front of it right at the center, under that bright white spot. 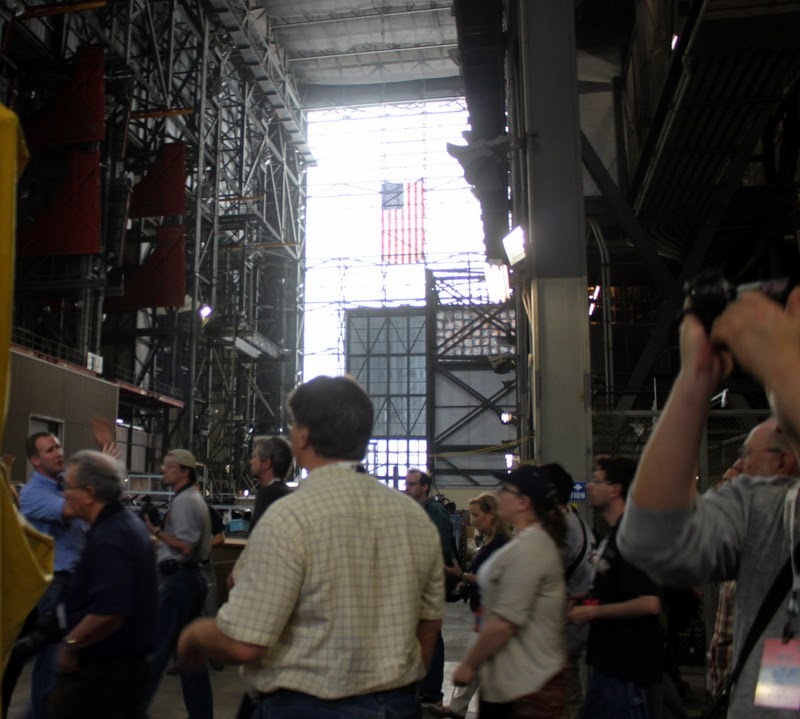 The VAB stands 525' tall, contains 45,000 tons of steel and the building alone has a 3-acre footprint. She was built to withstand a hurricane and she did. KSC has been offering up-close tours for a limited time after the closing of the Shuttle program. KSC will discontinue these tours on February 11, 2014 so they can put the old girl back to work. As a working spaceflight facility, the VAB will be put to use again for the new SLS launch systems for 2017. 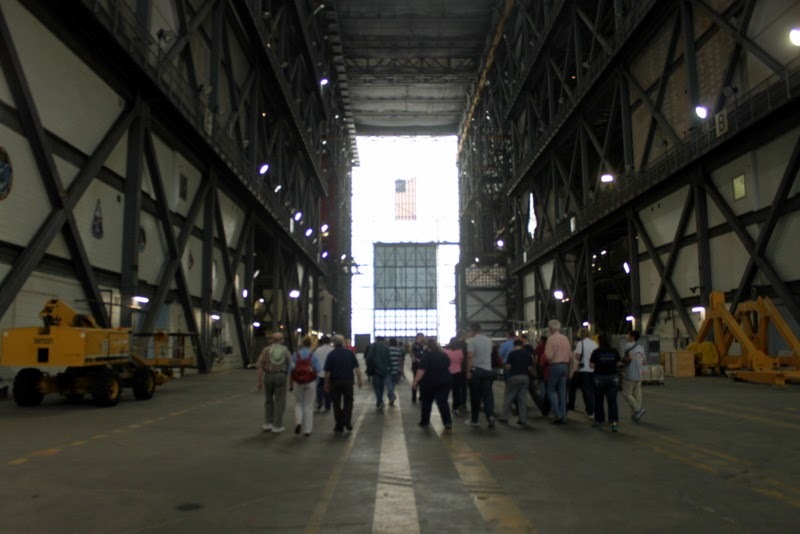 The KSC Up-Close VAB Tour includes a tour of the VAB with an expert guide, a tour in which you can see firsthand where vehicles were assembled for launch. Extra stops include a panoramic view of all launch pads from the NASA Causeway and the Apollo/Saturn V Center. This tour also includes General Admission to KSC. The tour is 2 hours and costs $75 per adult, $59 for kids 3-11. The General Admission includes tons of stuff - enough for two full days of fun at KSC - and includes the Astronaut Hall of Fame and a tour of the retired shuttle Atlantis. During the Shuttle program years, the VAB housed the Mobile Launcher and the shuttles were assembled here. The mobile launcher tower is brought into the building horizontal and brought to an upright position with 2 big daddy cranes. The shuttle is assembled and the Mobile Launcher is moved via the giant crawlers. 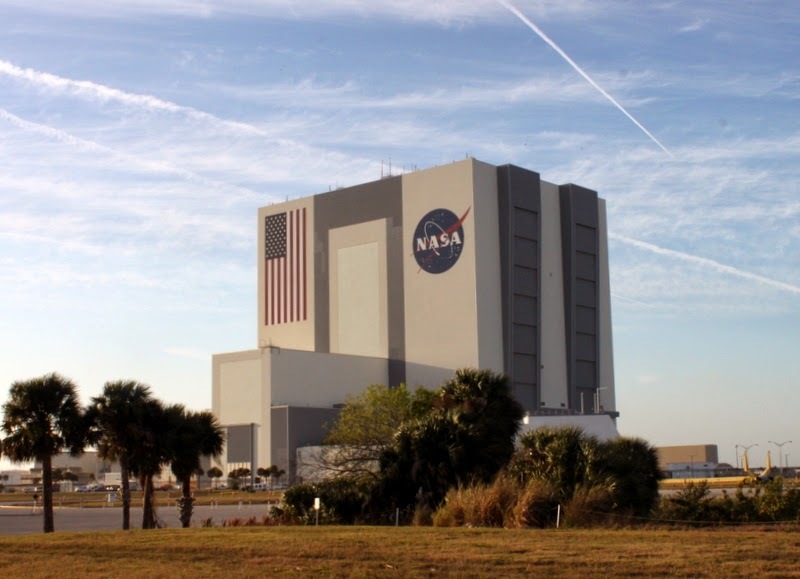 In the Apollo days, NASA had offices in the VAB which were removed during the shuttle program years because of the dangers associated with having the rocket fuel stored inside. 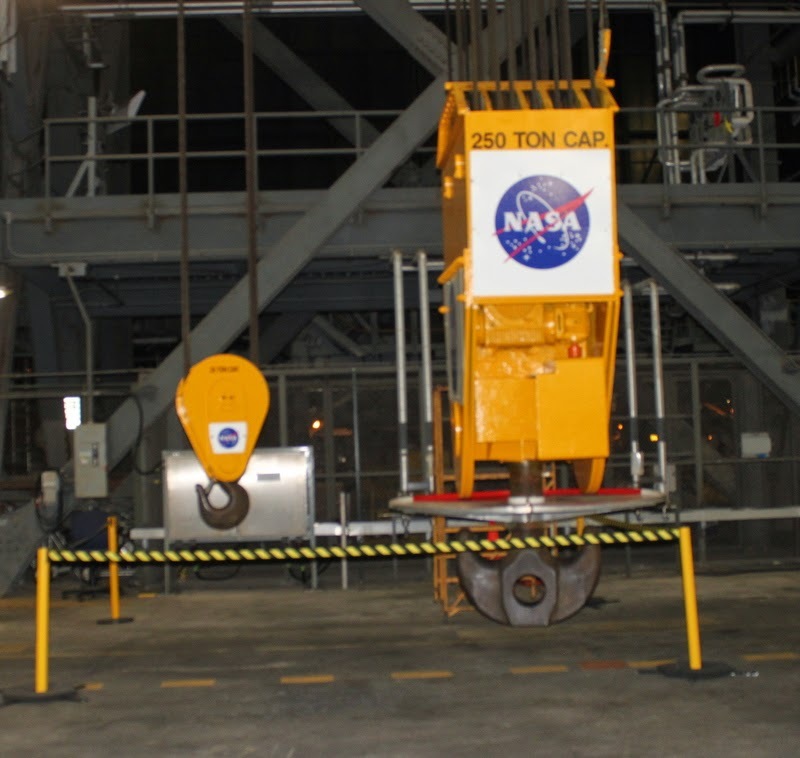 View more photos from the NASA TDRS-K Social where I had this VAB tour. If you sign up for a tour, I recommend you stay in Titusville and definitely eat at Dixie Crossroads. Get your morning coffee from Sunrise Bread Co. or Cafe' Chocolat and take it over to the river's edge. Go out on the dock and sip slowly while gazing across at Kennedy Space Center. Spend some time in the Merritt Island National Wildlife Refuge, too. And Stonefire Arts Center - go hear some live music and you have to talk to Maxine Trainer, tell her I sent you. Oh, and visit Indian River City UMC if you're there on a Sunday.